My long-suffering muggle family and friends might humour me for the first few times I declare ‘there’s a cache just over there on that railings,’ almost taking their eye out with the sudden point of my finger, accompanied by an air of triumph, as if I have just pointed out an A-List celebrity getting out of a Range Rover. Much eye-rolling will ensue after the fourth or fifth GZ declaration. You know it’s time to go when the store manager approaches you and whispers in a soothing tone, “I’m sorry miss but we’re closing”, ever so gently ushering you towards the car. It’s definitely a problem if you’re in a 24 hour supermarket. But look at all the Lock & Locks! So pretty…. First of all, plenty of people now leave the house wearing pyjamas. Personally, I prefer to change out of the clothes I wear in bed before leaving the house, but all rules and sense of dignity go out the window when there is a blank logbook crying out for your geocaching username. Nothing to do while your muggle half is shopping? Why not check out this railing outside just in case there’s an archived/not yet published nano stuck on it? “Do you have a pen?” “I have this geopen.” “Where are you going on vacation this year?” “We’re going on a geovacation to Portugal.” Where there’s a word, there’s a ‘geo’ to be added to it. Refer to initial humouring and subsequent eye-rolling in number 1 above. Many of us have shed a tear for a travel bug we have watched leave home only to never return home again, condemned to the bottom of someone’s geobag forever. So, when we find someone else’s bug that wants to be photographed in specific locations or with specific items, we are only too happy to oblige. Completely normal behaviour and don’t let any muggle tell you otherwise. The number one rule of geocaching is to sign the logbook. To do this, you need a writing implement. Best to hide hundreds of them absolutely everywhere “just in case”. Altoids? No, I actually hate the taste of them. 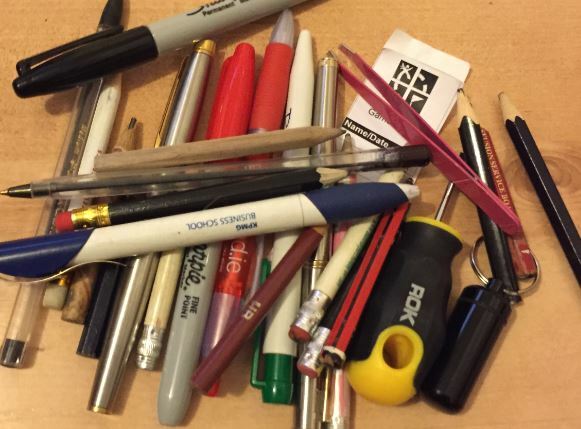 Empties entire contents in to the bin and goes off in search of a logsheet and some magnets. Can you think of anything else geocachers do that muggles don’t? Let me know in the comments! Reblogged this on Icke, Neuberlinerin. Sign your geonick on a credit card receipt. Pretend to talk into their mobile when it’s really a GPS just because muggles are passing GZ and you’re still not any closer to finding the cache! Crawling through shrubs in public parks arousing suspicion among muggles. Constantly seeking out new hiding locations when in a new area – then thinking up a good name for it! #13 – sees sticks and leaves laying around the yard and thinks they would be good camo. #14 – has a stock pile of camo duct tape. #15 – “flips off” railway cars which are generally points of interest in public parks (tanks too). #16 – has a caching friend whose non-caching significant other is blessed with an uncanny ability to find tricky hides. Have about twenty friends, that they don’t even know their real names! Becomes a fake photographer- arming oneself with an expensive camera just to look the part! Or in my case, I just take along my son who is an actual photographer. No more having to explain what we’re in weird places. He’s a photographer and I’m not letting my 15 yr old son go to strange places by himself. Works out great. …puts codes on cars, bracelets – even underwear…. and is happy as hell about every single log …..
Act like you’re taking pictures of the area but really looking at your GPS on your phone. Tying shoelaces 5 times in front of a park bench (and definitely not sitting on the bench), or “accidentally” dropping a pen or a coin on the ground. 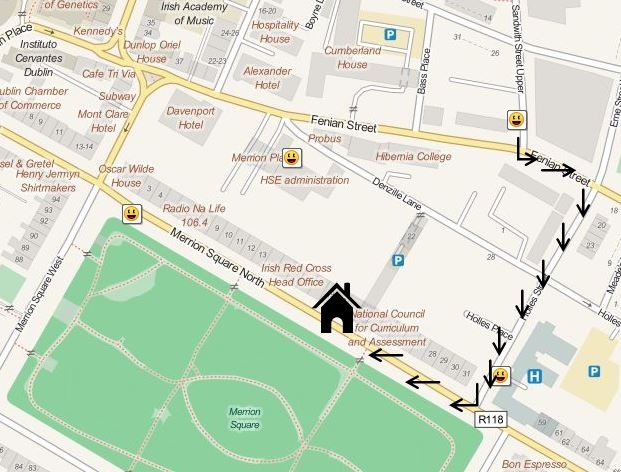 Transforming the GPS into fancy technical equipment for “measuring magnetic fields” or “locating the source of electrostatic noise” at grey power boxes in the street. Posing for an imaginary photographer 200 metres away, just to explain the awkward position standing on the toetips at a lamppost or hanging in a roadsign. “Shooting artistic photos” from silly underbridge angles or from behind a mailbox – until the mugglers finally leave the place. Parking the car at the road in the country side in the middle of absolutely nowhere and open stormy fields, just to visit that small white 12.2 km mark stick. When a pair of high heeled shoes has no interest in the shoe store and you just aim towards the shelves containing walking boots and shoes. When you visit a new town as Dublin or London and only sees the places where a cache is hiding. Last I visited London I went to several places where Jack the Ripper killed his victims. Not the usual sightseeings I think. By the way I think I can relate to at least 10 of your 12 things. I just realised – we met at my event in Bray in January, right? Go out to get a cache at lunchtime and come back with sticks and leaves in your hair, dirty and dishevelled. Happy yes, but everyone at work cannot guess what you have been up to. You nailed it! Guilty! of nearly every single one! Actually, since people at work know about my caching “habit”, they ALL know why I come back from lunch looking that way! Oh what fun. I’m new to caching but not so new that I don’t see the truth in all your points. LOVE this post–and the comments are phenomenal! I have these moments when I describe geocaching and people give me this look like “Sure, there are really hidden boxes all over the place that I’ve never seen” and then walk quickly away to someone who looks saner! Talk about distracted driving! Think “That’d be a great place to hide a cache.” As I’m driving down the road. Watch passing motorists slow down to a crawl because they think your GPS is a radar-gun! Love the list; identify with everything! Greetings from New Brunswick, Canada. When taking a vacation, choose a location that : a) is virgin territory for counties/DeLorme squares, b0 map out a route that will zigzag through as many new states, counties and Delorme grids as possible doubling the length the trip, c) has a challenge cache power run for most of which you have already qualified or d) is a power run mecca. OOPs!, chubby nubs at work here. bo should be b) and c) should read “has a challenge cache power run most of which you have already qualified for. (should have reread before hitting send. ROFL – Hysterical post and I am guilty of ALL of them. Please come over and visit my blog. 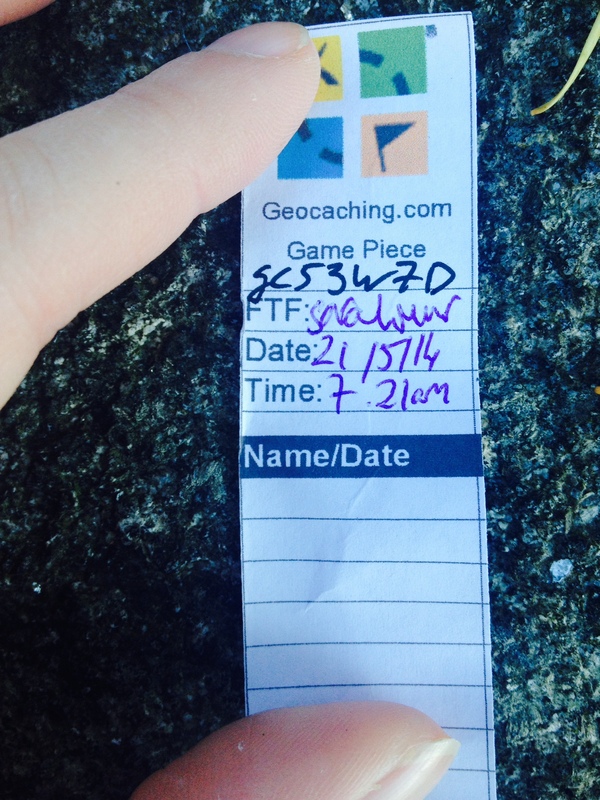 I write quite a bit about geocaching too. meet their future wife at a geowoodstock, ask her to marry me at the end of a mega event in front of over 2500 fellow geocachers, make the wedding a geoevent while making my dogs (who both have geonicks – myheine and 2themaxx,) the best geomen….and lest i forget, the wedding ceremony was performed by a fellow geocacher ! You keep a Baggie of geo goodies in each car. I admit I got given a brand new handbag once that I thought was hideous. The first thing I did was extract the little sachet of silica gel so I could use it to keep a log book dry for longer. I then gave the bag to charity and sent a thank you letter to the giver. “I will put this to great use”, referring, of course, to the silica gel. I can’t write the date without including my geo name. Pointing out every bird house you see and say: oh look a cache! Just for fun because most bird house are way too high ? Checks all bolts on nearby Street signs just in case they are a cache. Similar reaction with suspiciously places coins in dirt! Whenever I’m going somewhere I’ve never been before I check to see what caches are in the area. When my boss told me our office was moving the first thing I checked was what caches were nearby! 1. Ask neighbors of a large senior community to leave empty mid-to-large sized, screw-top medication bottles in my newspaper box. 2. Figure out how to stop neighbors from leaving empty mid-to-large sized, screw-top medication bottles in my newspaper box. 3. Take cartons of cammo-taped mid-to-large sized, screw-top medication bottles to Geocaching Event for prizes. 4. 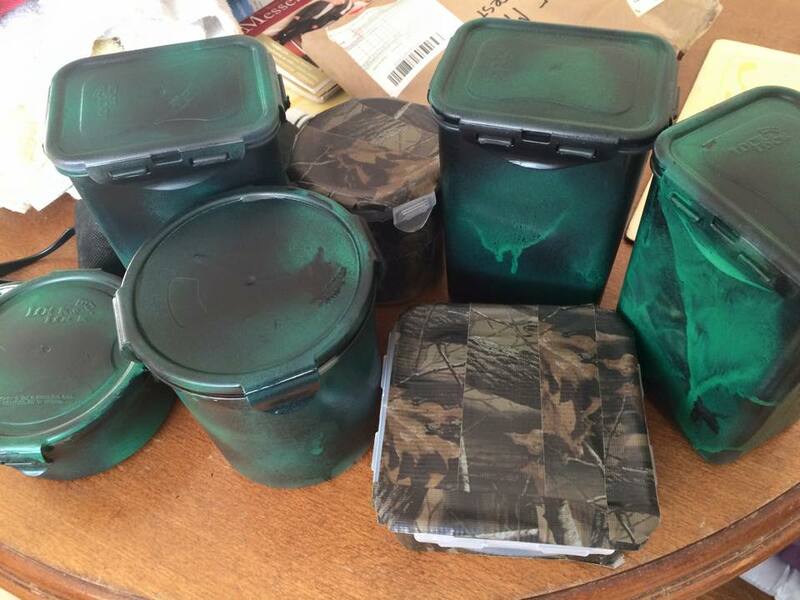 Throw cartons of cammo-taped, mid-to-large sized, screw-top medication bottles into trash bin after Geocaching Events. Explaining to muggles that you are helping to improve the Global Positioning System by conducting tests on finding test objects previously placed by other testers and that they can expect to see more people like myself because we have to test every type of device and make adjustments from time to time. When you’re in search of a geocache and muggles are walking by, you pretend that your trying to figure out what type of tree/plant that is. Look at everything as a potential hide container. When you get excited over a large size cache. Know all the local police officers because they have all stopped you wondering what you are doing. My granddaughter was looking on a bank in a country lane in Devon for a cache , when a tracter stopped and turned in to the gate next to where she was looking , the drivers asked her if she wasok and what was she doing , she politly replied “I am looking for a time box that I buried here many years ago I want to add things to it ” the two men said there is nothing here as this ground was flat last year and we dug it over and built up the bank , but my granddaughter said it must be here as I put it here myselve . The men started to help her look , we were sat in the car waitong for her wondering what she was going to say next and laughing our heads off ,.in the end the men said , oh I think we will leave you to it . It was even funnier when we realized we were in the wronge lane . HAHAHA you nailed it. I was going down the list going, “yup, yup, yup, yup” glad I’m not the only one. Hide a TB Hotel in front of your office so you can get all the travelers out of your desk drawer. While searching for a geocache off a walking trail, I had my young son, then age 4, pretend he was going to go pee in the woods, so muggles would stop watching us and pass by, so we could get the cache. – Take a quick look at almost every vehicle to check if there is a travel bug (with code) on it. Keep any container that may come in handy to hide a geocache in one day. Sitting on wet park benches to inconspicuously check out, if there’s a cache hidden beneath it. Go out in horrible weather to look for geocaches because 1. less chance that muggles will see you and 2. you want to. omg,I score 10 out of 12! 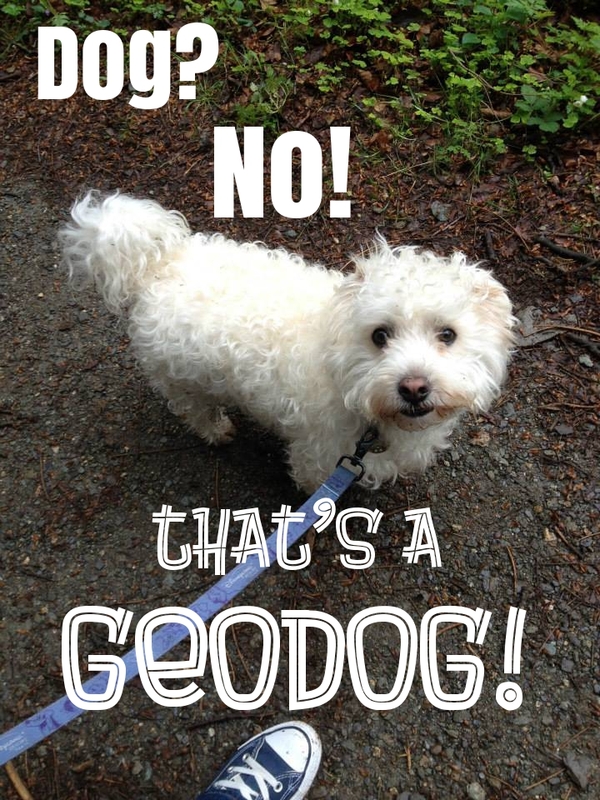 Does that make me a geo-nerd? ? in every pocket you find a pen you also find a tweezer. LOL. Lift random lamp post skirts looking for caches. Hang out in the party section of the dollar stores looking at all the potential swag items. Portugal is a beautiful country, there are a lot of beautiful places to visit, big cities like Porto and Lisbon, but some rural places which are so so beautiful and they have caches too. If you plan carefully, you can get Portugal, Spain, Gibraltar and Morocco in one trip. (There are day excursions to North Africa from Spain). Then there is the situation where 2 geocachers start talking in a ‘business’ meeting about their latest finds and completely confusing everyone else! 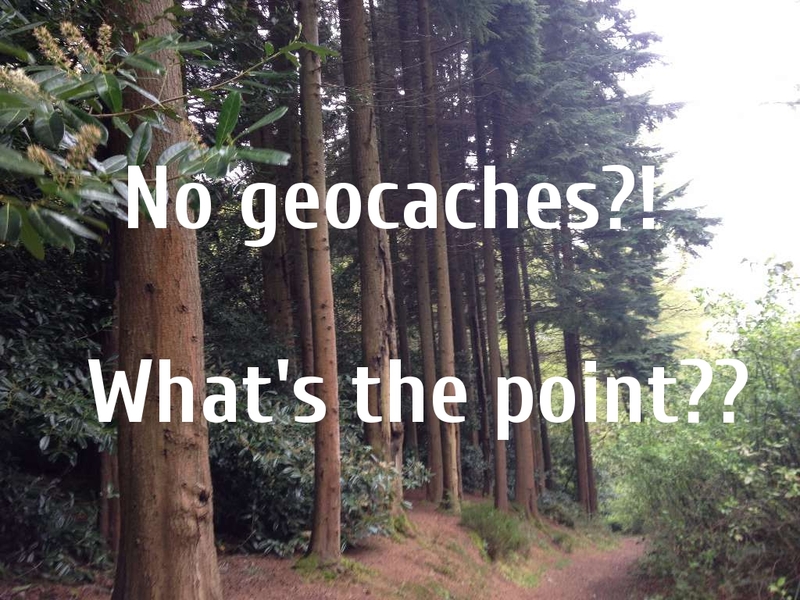 Wish some of my colleagues were geocachers – they just glaze over when I talk about my finds ? I have to go caching in Norway sometime! Looking at a area and thinking “That would be a great spot fior a Cache !” And checking to see if there is one there. What Only Geocachers Do: When suddenly approached by a muggle they pretend that they are looking for a „lost“ key. How embarrassing when the muggle joins you searching. But how nice that you have met a helpful person. Guilty! 10 out of 12 (if you don’t count gym trousers for no. 4)! Give sophisticated explanation of a certain rock type to an astound muggle, cause you know that from a previous Earthcache. Oh yes I’ve been there!! 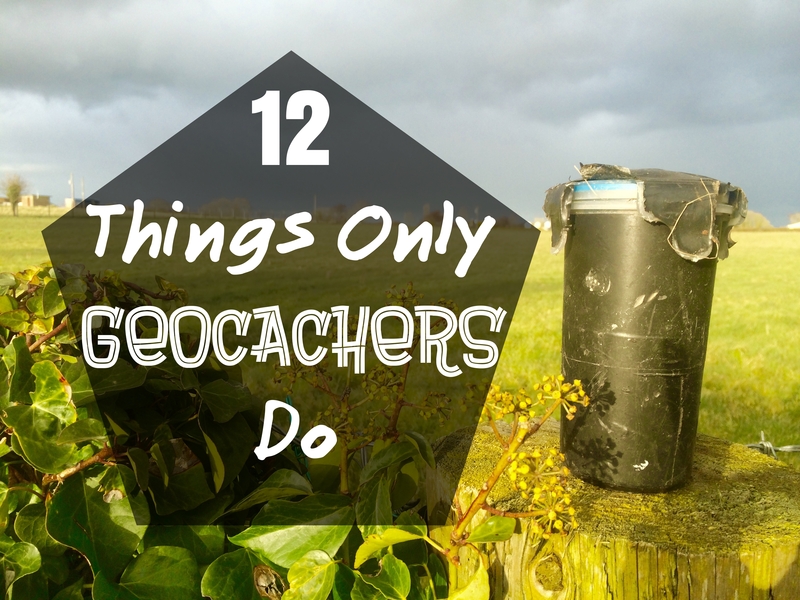 ‘Things only EarthCachers do’ ? Agree to drive for summer vacation from MD to UT and back because you have bartered for a stop to get Mingo and at least one cache in every state you drive through! As an elementary Secretary, you claim all leftover trinket incentive prizes from the recent fundraiser as well as the unclaimed lost and found box at the end of the school year for the gallon plastic jug of swag in the back of my van. We’re all that weird employee who geocaches I guess… unless the boss is a geocacher too!! Oh, never thought of number 12… Thanks! Will see after next weeks food shopping… There is a possibility malnourishment may be a side effect of snazzy new cache containers. Ignore a million emails that come through but the minute you get one that says Geocaching you drop everything to open it and read it’s contents. Talking to an imaginary friend on an imaginary phone (the GPS) waiting for a muggle to go away. Stopping to pick up random pieces of driftwood/small logs along the road when walking the dog, to see if they would make good ‘natural’ caches. Coming home from ‘running errands’ looking like I’ve wrestled a cat and lost, from looking for a geocache that required some bushwacking. I’ve come back to the office from lunch break like that! Willing to drive hundreds of miles out of our way on vacation just to add a new state to our stats map. Carry a clipboard and pretend you’re actually inspecting the trees, bridge, park bench or lamppost when a muggle walks by.